Nothing gets me more excited then shopping, especially makeup shopping. My holy grail items are the ones in which I find myself repurchasing frequently. The top 5 holy grail items, are simple, quick & effective. 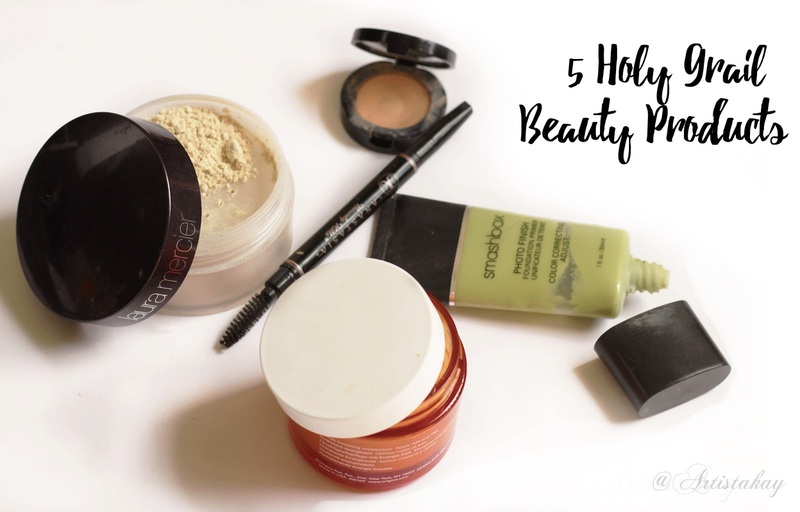 If I didn’t have these 5 products I don’t know if my makeup game would be the same. I have seen people talk about their holy grail, must haves, ride or die– however you word it–and I absolutely love it, I am introduced about new products in detail all the time. Now don’t get me wrong I do have other products that I can swear by but at the moment these are the ones. Every makeup advocate can swear by a couple of products that work spectacular for them and these are my 5 picks. 1) Laura Mericer Transulcent Loose Setting Powder –The whole beauty community is pretty much obsessed with setting powders to bake, set and add a soft finish to the skin. There are so many setting powders to choose from, but it‘s pretty easy for me to say this is my #1 holy grail. This translucent setting powder is light, help with creasing and gives a soft finish to the skin. Now if you are thinking what‘s a setting powder, fear not I will give a brief explanation. Setting powder helps set the makeup in place, it will prevent the foundation from moving around, caking. It sells for $38, kind of pricey but worth every penny, trust me on this one. 2) Smashbox Photo Finishing Color Correcting Foundation Primer- The love story between this primer and I started out a couple of years ago when it was just a sample I got at Sephora. It quickly became my favorite primer to-date. This primer reduces the appearance of fine lines, evens skin tone, and redness, when you initially apply it to the skin it will be green, once you start to gently smear the product around the face within a minute or two the redness should diminish. This alone, you might not even need foundation if all your wanting to do is cover up redness and minimize pores. Retails for $39. 3) Origins Ginzing Energy Boosting Moisturizer- Hands down one of my favorite moisturizers on the market. I have tried quite a few brands, i just keep on coming back to this; let’s just say we are inseparable. This moisturizer has a refreshing scent to it, a hint of orange zest; will help radiate your face. I did do a Review on this moisturizers a while back, check it out. This retails for $27. 4) Bobbi Brown Corrector –We all had one or two sleepless nights, –especially if you have kids… let’s just forget about sleep all together shall we? I have purchased this corrector numerous times and probably again in the near future or until I find something better. This Bobbi Brown Corrector helps with the discoloration underneath my eyes and wherever i really need it., its consistency is a little bit thicker then other corrector which helps conceal the blue/purple discoloration around my eye area. I use this on the daily; I did try out a couple of other correctors, nothing really compares to this one for now. This corrector retails for $27. 5) Anastasia Beverly Hill Brow Definer- I am a “die hard” fan of anastasia brow products. Seriously, I am. I go through the brow wiz one every 6 months, I also use their brow pomade and brow powder. What’s interesting about this that it the tip is a narrow triangular shape, so filling in the brows has gotten a lot easier. The spool on the opposite side is thicker then the brow wiz, which is in my opinion better because it helps disperse the product through out the eyebrow more evenly. This retails for $20.